Curried Tofu Salad – Crumbled firm tofu, crisp celery, and juicy apples mingle amongst a creamy, tangy curry dressing. Perfect on it’s own, with crackers, or piled high on a sandwich. Quick and easy to make. Vegan and gluten free. I have a new obsession and I can’t stop eating it. No, shockingly, it has nothing to do with chocolate or pumpkin or cinnamon. It’s this Curried Tofu Salad! I’ve been eating it two sandwiches at a time. I don’t even care if I tear up the roof of my mouth on some straight-from-the-toaster bread because I love the contrast of the soft creamy tofu salad and the crunchy toast. Morning, noon, and night, this has been my go-to for the last several weeks and I’ll be making another batch yet again this week because I just can’t get enough of the stuff. It tastes like egg salad. Except that I never liked egg salad. And I especially never liked the smell of egg salad. My tofu salad recipe, unlike most egg salads that I’ve seen, has some texture to it. I’m big on the crunch factor. There is no place for mush in my kitchen. I’ve added diced crisp celery and crunchy apple to bring life to an otherwise soft salad. I’m also not loading it down with mayo. Just a few tablespoons of vegan mayo bring a wonderful creaminess to a dressing made mostly of coconut based yogurt. A touch of dijon and lemon juice add the perfect tang and balance. And, of course, there’s the curry powder. It’s mild and earthy and brings just the right amount of flavor to keep you coming back for more…and more. A vegan tofu eggless salad. 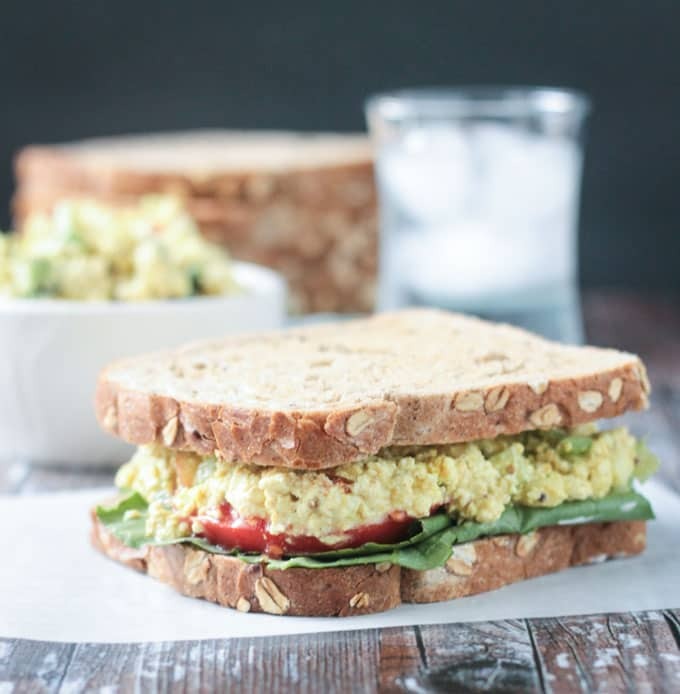 Think of this as an egg salad you’ll actually want to eat! This Curried Tofu Salad is so easy to make. After pressing your tofu (which is totally hands off), it can be made in about 5 minutes. And the great thing about this recipe is that it tastes even better the next day after the tofu really has time to soak up all the flavors. 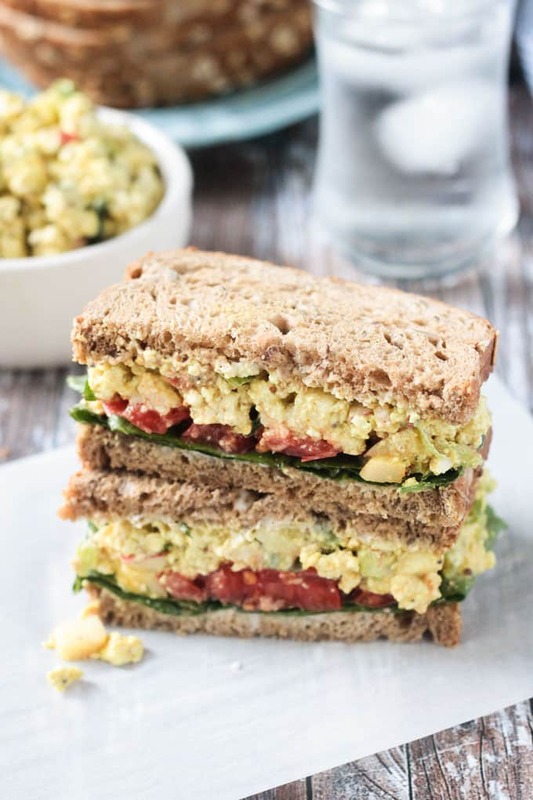 So, whip it up ahead of time and it will be ready when you are to assemble your tofu salad sandwich. Or enjoy it with crackers, stuffed into a pita, or straight up from a fork. Love Sandwiches? Check out these recipes you’ll love! I hope you love this Curried Tofu Salad as much as I do. If you try it, please come back and leave me a comment below with your feedback. Curried Tofu Salad - Crumbled firm tofu, crisp celery, and juicy apples mingle amongst a creamy, tangy curry dressing. Perfect on it's own, with crackers, or piled high on a sandwich. Quick and easy to make. Vegan and gluten free. In a medium mixing bowl, whisk the yogurt, mayo, mustard, lemon juice, curry powder, turmeric, salt and pepper. With your clean hands, crumble the pressed firm tofu into the same bowl. Don't be perfect - leave some pieces bigger than others and crumble some pieces smaller. This will help give the salad extra texture. Add the chopped celery, apple, green onion, and parsley to the tofu. Mix well until everything is well covered in the creamy curry dressing. You can enjoy this right way or store it in the fridge to let the flavors come together even more. *To press tofu, place a clean dish towel (or paper towels) on a plate. Place the block of tofu on the dish towel and cover the tofu with another clean dish towel and then another plate. On the top plate, place some heavy cans or bags of dried beans to press it down. Press for about 20 minutes. Hi, Lisa. Glad you enjoyed it. Can he eat pears? Pears would be a great sub, or even cucumbers are fresh, juicy and have a subtle sweetness. It’s so interesting. I was just discussing food allergies with a few of my blogger friends. There are so many foods that are related and most don’t know it until it creeps up as an allergy. Apples was a new one for me. I’d never heard of that being a tree nut allergy, but you prompted me to look it up and (obviously) it’s true! So, for next time, I would try adding a bit of cucumber or maybe even jicama! Jenn, I can’t say enough about the Curried Tofu Salad I just tried it today for the first time and I simply ADORE it. It is so flavorful and tasty, but most of all healthy. I am currently on a diet and prepared this for lunch and WOW I honestly was over the moon in love with it and will share the recipe with my daughter. This salad will definitely become a part of my healthy food rotation. Thank you so much for the recipe, can’t wait to try your Beet Smoothie! Thank you so much, Gracie! I am so happy to hear you loved it. I hope your daughters enjoy it too. And let me know what you think of the Beet Smoothie when you give that a try too! Thanks for stopping by!! I have made tofu “egg” salad before, but never like this! This recipe has so much flavor! I also love the crunch factor too. I made this and then brought leftover to work the next day and all of my co-workers were eying it. I will definitely be making this again to pack for lunches. Thank you for the recipe! Oh, yay! Thank you, Hannah! I’m so glad you loved it. I think leftovers the next day are even better than day of! Thank you so much for making it and leaving your feedback. I appreciate it! 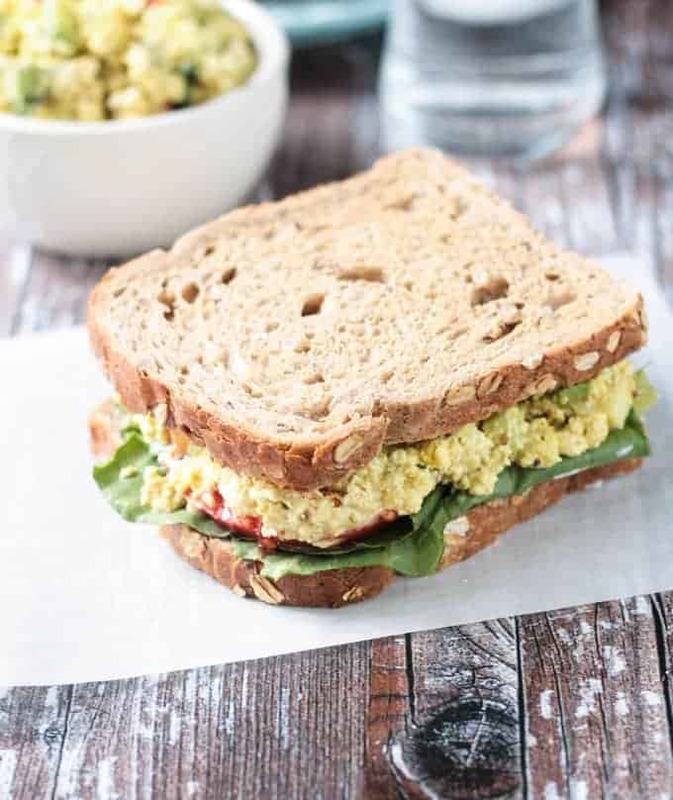 Curried egg salad was one of my favorites when I used to eat eggs. This looks and sounds amazing, Jenn. I can’t wait to try it. I’m so excited to try this! I bet it would be great in lettuce wraps, too. Ooh, lettuce wraps is a great idea! Gonna have to try that next time! Thanks, Alisa! Beautiful photos! And that tofu salad looks incredible! Thank you so much, Sarah! I was really happy with how they turned out! This is such a fabulous idea – I really love the sound of this (and that’s from someone who isn’t really a tofu fan). I will just love this though. Well maybe this will make you a temporary tofu fan! 🙂 Thanks, Trinity! This looks so tasty – and I love curry flavors! Perfect for lunch! YUM! How did you know I was craving this? Can’t wait to make it! Well, because who isn’t craving curried tofu salad, amiright! LOL! Thanks, Joanna! Two questions: 1) Does it taste like Dijon mustard? My hubby and I don’t care for the taste of Dijon, although we have used it in recipes as long as the final product doesn’t taste like Dijon. 2) Any suggestions for a substitute for the yogurt (i.e. less processed)? Thanks for sharing this recipe! This looks awesome! I LOVE the addition of the apples! I agree—no mush! Gotta have some crunch! Texture is so important! Thanks, Sarah! I can see this curried tofu salad becoming an obsession with me too! This looks so amazing! And I love anything with curry! I’ve been on a huge curry kick lately. Can’t get enough. Thanks, Taylor! So funny that I found this because I’ve been in the mood for this type of sammie! Definitely bookmarking this one! Perfect timing! I hope you love it, Rachel. Let me know how it turns out. This sounds like the best idea EVER! Haha definitely need this for lunch tomorrow! So I never knew it was that easy with tofu. For some reason I thought it was a lot more work! Yum! Prepared this way it’s super easy. Usually if you’re baking it or even just frying it a sauté pan, it does need to marinate for awhile after pressing it, so maybe that’s the extra step you’re thinking of. Let me know if you give it a try! I love this idea. I’m not very creative when it comes to tofu and I’m always looking for new ways to prepare it. Thank you! Thanks, Rachel! I don’t know how creative this is, but it sure is delicious! I actually really enjoy egg salad! But I think I’d like this even more! Such a great healthy lunch! 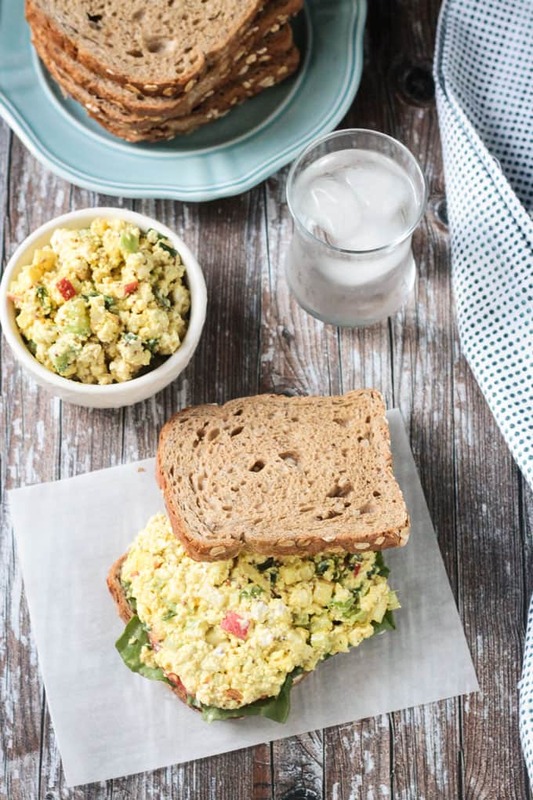 This looks just like egg salad! I love making it with chickpeas but have never tried tofu, so smart!! Great idea, can’t wait to try this. I even love it just on it’s own for a snack or added to salad..so good. Thank you, Deryn! Chickpeas are always a great choice too! They’re my go-to for so many dishes. Hope you love this tofu version. Let me know if you give it a try. Aah I love this! It looks super flavorful and like such a fun way to mix up the usual tofu salad. Thanks, Becky! I can’t believe I’ve never had tofu salad until now. Totally addicted! This looks like the perfect lunch! I’ve made tofu “egg salad” before, but I’ve never thought to add curry powder. Such a great idea! I never even liked curry growing up, but the last few years I just can’t get enough of the stuff! I especially like it with tofu….so good! Thanks, Dianne!